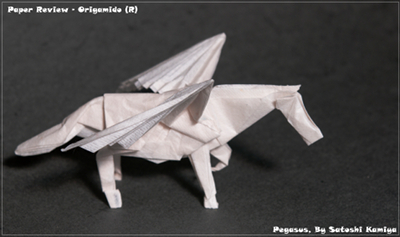 I bought Origamido® more than 6 months ago and had never dared to touch, never mind fold it. The mere idea of having to choose a model froze my mind. What model is worthy of this paper and can I fold it perfectly? Nothing came to mind and probably never would have. This paper was doomed to lie forever flat. Origamido® is made by Michael LaFosse and Richard Alexander at their studio in Massachusetts and true to the real meaning of custom made, is often made according to the special needs of an artist and their chosen model, sometimes in collaboration with them. For example, Mr. LaFosse has stated that his Frog requires a special formula, quite different from, say, Robert Lang Insect Paper. To achieve these differences they use a range of fibres each with specific properties; Abaca, Hemp, Flax, Cotton Linters, Cotton Rag, Linen Rag, Kozo, Gampi and Mitsumata, which they blend to produce the desired paper. Michael LaFosse: "The fibres are cleaned, soaked in water and beaten, either by hand or by the Hollander Pulp Beater. The beating times can range from half an hour to six or eight hours. The beating time is critical for achieving certain results. The pulp is then colored with permanent pigments and dispersed in a vat of water. A papermaking mould is submerged and then lifted to screen out a layer of pulp. This layer of pulp is then transferred to a wet sheet of felt. The process is repeated until the pulp is exhausted. 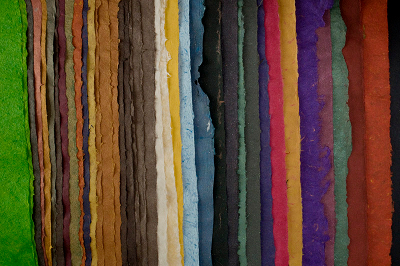 The stack of pulp and felt is pressed and then the sheets are removed and then dried. Thickness is controlled by the concentration of pulp in the water and the skill of the papermaker. Thickness is maintained by regularly adding measured amounts of pulp to the vat after a few sheets have been formed. We also make paper the Japanese way, "Nagashizuki", in which the thickness of the paper is built up in multiple thin layers." You can attend a workshop to get to try out the papermaking procedure yourslf if you happen to be in Massachusetts. I wasn't, but did have the opportunity of making some handmade Kozo paper in Israel. You can read my report on that experience here. Being handmade also means that thickness and color may vary from sheet to sheet. Every sheet is unique. This all sounds good, but it creates a problem for paper reviewers. Participating in a workshop is not practical and if we buy it online, we cannot know what each paper was made for. A true test would be possible if the right papers were made for our test models. However, since this will not happen, all we could do was to try and match what paper we had to the right model. Consequently none of the papers is perfectly made to meet the models’ needs, but they represent what is available online. White, the thinnest, 23gsm, semi-transparent. Blue, the thickest, around 45gsm, with a visible net pattern on one side. Brownish Red, Olive Green and Grass Green, all around 35gsm, with opaque surface. Please note that each is different so we actually valued 5 types of Origamido®. 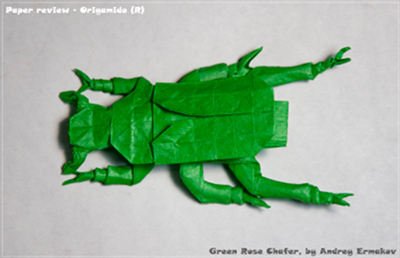 With limited resources, we also had to cut down the list of models – so based on what we judged would be most likely to be folded from Origamido® we removed the Traditional, Action and Modular models but added Insects. Semi-transparent paper cannot be colored on one side only, whereas this restriction does not exist with opaque paper. Thickness: The manufacturers can make paper from 10gsm to 100gsm. Our test papers measured from 23gsm for the white with an average thickness of 65 microns (half that of Tant or EH! ), and 32gsm for the Grass Green with an average thickness of 90 microns. Sizes: The most common size is 40 X 50 cm (the only size sold online); also available are 22 X 30 cm, 50 X 75 cm, 58 X 66 cm, and 75 X 100 cm. There is also the capability of making paper 6 feet wide by any length. Colors: Any shade you want, if it is custom made! Available to buy online (www.origami-shop.com) are Blue (variation from light to dark), Violet (variation from light to dark), Gray, Pink and old pink, some green (variation from light to dark) and some Brown (variation from light to dark). Paper Coloring or Colorability: The white, being semi-transparent, cannot be colored on one side only since the color is immediately visible on the other side. Coloring the Olive Green with Ecoline white water-color shows no such thing happens here. The moisture doesn’t ripple the surface, but it does curl a little. Texture: The Blue is like a fabric. The thickness is uneven and there are some residual ‘bark-like’ pieces. The White and Blue papers both have a visible pattern on one side from the net on which they were dried. When backlit, the Blue is magnificent! The unevenness creates a beautiful cloudy effect and the net pattern adds to that. The White looks like there are holes scattered around indicating how thin it may be in places. The Olive Green, at certain angles, sparkles as though sprinkled with stardust! 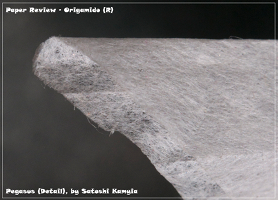 The fibers are visible in the semi-transparent paper. The paper sparkles as though sprinkled with stardust! 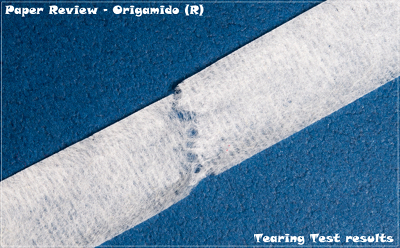 Aging and Wear and Tear: Since I have little experience with Origamido®, I asked Dr. Robert Lang to give his opinion, "I've never seen any signs of deterioration in Origamido® paper. As with all papers, if a figure is placed under continuous stress (like a standing figure whose weight is off center), it will sag over a period of years, but the colors remain true and there is no yellowing or embrittlement. I know that Michael pays attention to aging issues, using stable pigments and pH-balanced, lignin-free fibres in his paper." The tearing test at the lab gave the white 23gsm paper a score of 989. In comparison, copy paper (80gsm) made 550, and Elephant Hide 1130. Memory: The thin white paper had very little memory of folds, but the Olive Green was close to perfect. The Blue felt like folding a thin fabric which may be due to its having very long fibres. Between 5 and 9 out of 10. Forgiveness: Reversing a fold on the white paper is not easy. Although a strong crease leaves its mark, the effect on the other side is surprisingly small. With all the other papers it is much better. The Grass Green has some thin parts that resemble the White, but in total it is good. 6 to 8 out of 10. Tensile Strength: Tensile strength is the maximum stress the paper can undergo while being stretched or pulled. This is the strongest paper that I and the QA tester have ever seen. The numbers are amazing. The Grass Green held under 21 Kg before tearing apart, and the white (23gsm) held until 12.6 Kg! Compare this with 110 gsm Elephant Hide which held up to 15 Kg and 7 Kg (with and against the fibres respectively). When stretched, the white paper stretched by 5.4 mm (EH was stretched to 12.5 mm). As you can see, the white is still holding some form after it was broken by the machine! The bending resistance is very low. Bending Resistance: Bending resistance relates to the amount of force required to bend the paper. Thin paper has little bending resistance and this is no exception. 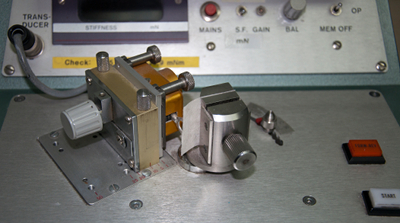 This can be tested with a Resistance Test - a square piece of paper is tightened and the machine pushes onto the free surface of the square. The white has almost no resistance whatsoever. Its score was 4 (EH got 300 and Tant scored 130). The Grass Green only achieved the value of 1. Total score here is 2 out of 10. Photogenic: A picture is worth a thousand words and, when using Macro lens, even more. The mica sparkles add a luxury look, and the texture is candy to the eye. A wonderful paper to photograph. 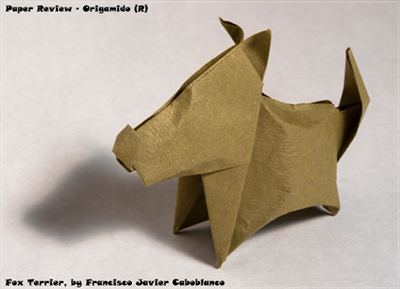 Make your own paper during a work shop in the Origamido® studio like Satoshi Kamiya, Robert Lang, Chris Palmer, Brian Chan, to name a few, or buy leftovers from previous projects if you in Massachusetts. 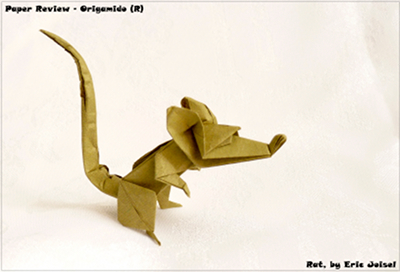 Here Origamido® paper is sold only in person, no online option. Attend the NYC OUSA convention and be there on the first day. Otherwise little, if any, will be left for you to buy. Nicolas Terry (France) has purchased some stock for resale and he is the only online seller. The stock is small, so there is a limit on the quantity per person. Gallery Origami House (Tokyo) sells it only during the Japanese conventions. The Paper Tree (San Francisco) has some, but I got no reply from them so I do not know if they sell it online or at all. Tensile Strength (previously simply called "strength") is the maximum stress the paper can undergo while being stretched or pulled. Bending Resistance (previously incorrectly called "tensile strength") relates to the amount of force required to bend the paper. 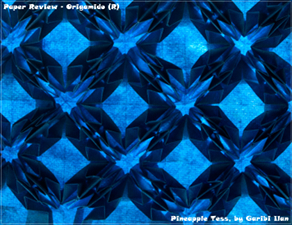 Note the net pattern and the imperfections in the fold where all the pineapples meet. You can achieve fabulous backlighting effects. Prior to pre-creasing the grid, I had to decide on the right molecule numbers. With such thin paper I wanted to make small molecules, so I decided on a one cm spacing, creating a 40X50 grid. I also decided to leave the rough edges and not to cut it to a square. The grid was easy, but reversing every crease was difficult. With long fibres the other side of the paper is only slightly affected by the creases and to reverse it you have to re-crease it firmly. While pre-creasing, the unevenness of the paper is noticeable. The parts that are thick fold with a "click!" while the thin areas just ignore your efforts to crease them. Unfortunately here and there you can hit a fragment of bark, making keeping the line straight a tough job. Collapsing the first stage was OK, but the final collapse was difficult and demonstrated the shortcomings of this paper. With low bending resistance there is no "snap into place" but a flexible surface that won’t go where you want it. The final result is nice but far from perfect. However once back lit, this dark blue paper looks amazing. It's easy to add lots of details with the 23gsm paper. For this I chose the thinnest paper, white. Cutting it must be done slowly and accurately! I cut a 30cm square and coated half of it with MC (I wanted to see the effect on such thin paper). While drying the coated part rippled a little but not so much to be a problem. The folding experience is very good. Despite it being so thin, creases are well formed (using a lot of finger pressure) and reversing is only possible with some care and effort. This meant that the open sink (step 37) was a bit of a challenge. The benefits of 23gsm paper are very noticeable with this model. It was very easy to get all details and shaping the wings was remarkably accurate. As expected the MC side is firmer, but the other wing is stable as well. All in all I am very happy with the result. Pure and clean folds can be easily achieved. It was fun and easy to fold with this paper. Details are easy to mould and the result is very nice and satisfying. There was no need for wet folding, but I did use a bit of MC. I chose the Olive Green paper which is firm and feels like 50gsm, although measured to be 36. It was very easy to fold and mould. The paper is crisp and does exactly what you want. No need to wet fold, but I did use some MC to keep its legs together. It was easy to wet-shape the legs. 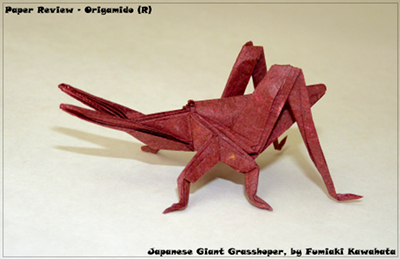 Participating in the "Origami Internet-Olympiad 2011", this model was one of the given tasks. I chose the Grass Green, 32gsm, cut to 30X30 cm. Having folded a draft model with 40gsm Kraft paper, I had a reference for comparison. Folding the 38 x 38 grid, as well as all the other pre-creasing, went well. Again, reversing a fold requires some persistence. Collapsing the base was mostly satisfying, except for at the corners of a box pleat, where you need some bending resistance from the paper. It was frustrating if a corner like that fell on a thin part of the paper. The paper gave very little resistance and just broke and/or crumpled. 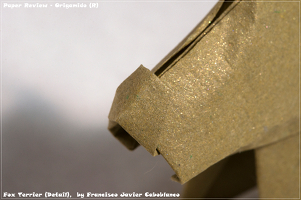 However the advantages of the Origamido® were visible in the finishing – wetting the paper with some MC allowed me to shape the legs easily. Details that were impossible to achieve with Kraft or, it seems, with any other paper, materialized easily. What was a rectangle shape with 8 long rectangles picking out became a lively insect. There is so little to say, since everything just worked perfectly. The main benefit is that with thin paper it was easy to shape the legs even with so many layers. 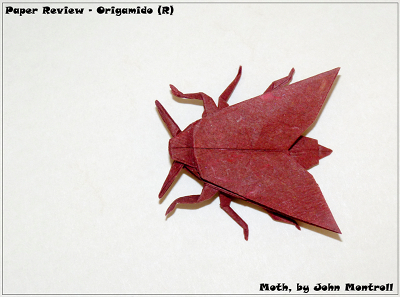 Just like the moth, it was a pleasure to fold, and easy to get all the details. This paper is perfect for any participant in the Bugs War. While many great artists say this is the best origami paper in the world, I, as a tessellator, was expecting a perfect paper for my tessellations. It is not. For every complex model we tried, it gave us the best results ever. Super complex models will benefit from it even more. This paper blows away all others in the scientific tests, giving unbelievable results, in regard to strength-thickness ratio, and in absolute values, too. There are some shortcomings, such as unevenness; low bending resistance; small bits of bark here and there; net texture highly visible. But, as Gadi said, with all the hype around it, we did expect it to be asked politely and to fold itself to the most amazing models. It didn’t. But yes, this is a high end paper that should allow anyone to fold high end models. 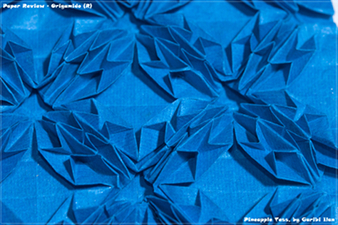 Using the Flickr to search for Origamido®, I found 319 results, but many refer to the studio, and not the paper. I counted 128 models, 127 animals, complex to extreme complex, mainly insects. The single exceptional is a tessellation, following Goran Konjevod’s style. 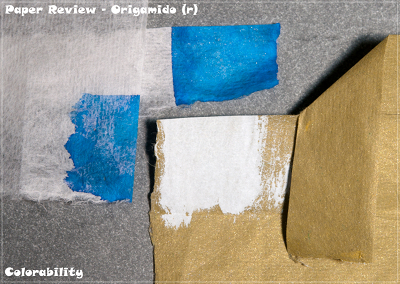 Many images are showing personal stocks of Origamido® papers, from which I chose one for the color palette image. Bottom line: Dare to try! Special thanks to Dr. Robert Lang, for his help with the Aging section, and Isaac Gorden, for his Origamido® collection image.